GORE, Christopher, a Senator from Massachusetts; born in Boston, Mass., September 21, 1758; graduated from Harvard College in 1776; studied law; admitted to the bar and commenced practice in Boston; member of the State constitutional convention in 1788; member, State house of representatives 1788-1789, 1808; United States attorney for the district of Massachusetts 1789-1796; commissioner to England 1796-1803; Charge dAffaires at London 1803-1804; member, State senate 1806-1807; Governor of Massachusetts 1809; appointed and subsequently elected to the United States Senate as a Federalist to fill the vacancy caused by the resignation of James Lloyd and served from May 5, 1813, until May 30, 1816, when he resigned; overseer of Harvard University 1810-1815 and a fellow 1812-1820; died in Waltham, Mass., March 1, 1827; interment in Granary Burying Ground, Boston, Mass. Pinkney, Helen. 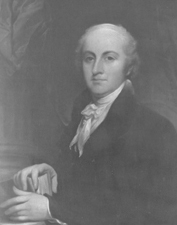 Christopher Gore, Federalist of Massachusetts, 1758-1827. Waltham, Mass. : Gore Place Society, 1969.